Kantar Worldpanel’s Brand Footprint ranking reveals the brands that are being bought by more people, the most often in 35 countries around the world, across the food, beverage, health and beauty and homecare sectors. Using an unique metric Consumer Reach Point (CRP), the report outlines the winning strategies that most successful global FMCG brands are employing as well as key global industry trends. 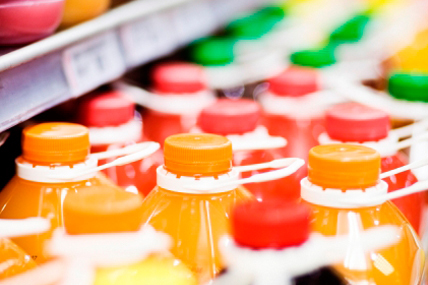 From the Brand Footprint study, it is not hard to pinpoint consumers’ growing desire for health, which in turn is driving the growth of related categories, and this is also apparent for the beverage market too, with tea, sports drink and bottled water, the product segments that highlights health benefits such as low calories demonstrating growth in both global and Taiwanese market. In Taiwan, the epitome of healthy drink - dairy products (fresh milk, soy milk etc. ), was especially outstanding. 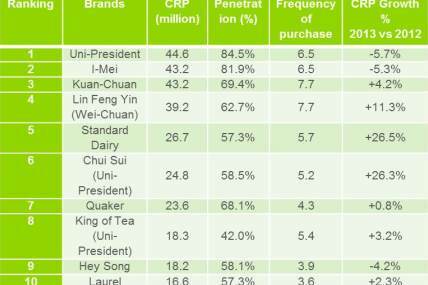 Dairy brands including Kuang Chuan, Chui Sui, Standard Dairy and Lin Feng Yin have all gained additional CRP in 2013, as well as moving forward in ranking placing. Compare to other categories, the performance of dairy brands was particular extraordinary as they are able to achieve such incredible consumer traffic with just a single or few product segments, ie. Lin Feng Yin achieved more than 30 million purchases with its fresh milk product alone, placing it in 2nd place among the beverage ranking, reflecting the brand’s strength in leading innovation for such a simple product. While RTD tea’s performance remained flat compared to 2012, the popularity of this beverage segment is still apparent, with over half of the brands in top 10 ranking being a RTD tea manufacturer. For Taisun, although it did not enter the top 10 beverage ranking, the brand warrants a special mention as it is the success of their herbal tea launch last year that drove the growth of the brand’s overall ranking. Taisun’s total FMCG ranking has moved forward 13 placement for 2013, making it the fastest growing Taiwanese brand in terms of ranking. Taiwan’s Sports drink segment is rebounding back from the plasticizer incident. Leading brand of the segment, Super Supau maintained 9th placing in the ranking, but it has gained additional 12.8% purchases compared to the previous year, reflecting the country’s growing sports population, which presented a new growth opportunity for the sports beverage. Global Top 10 brand ranking – Coca cola, Nescafe, Pepsi, Sprite, Tang, Milo, Fanta, Minute Maid, Lipton and Gatorade.Coca Cola remain No.1, Fanta grew fastest – Coca cola is the only beverage brand with over 40% global penetration. With a 4% increase in Consumer Reach Points, Fanta expanded its market penetration adding 5.6 million new consumers and increased the frequency of purchases in emerging markets with innovation and strong marketing including its first ever global digital campaign. The Coca-Cola Company owned brand was chosen more than 749 million times globally in the last year, even though Fanta lost reach in developed markets. Many brands lost ground to emerging local brands particularly in Asia where local brands dominate. Est soda in Thailand is already bought by a third of the population; local brand Great Taste has won shoppers from Nescafe in The Philippines and in Latin America; both Tang and Clight have been attacked by local powered drink brands such as Suntea, Arcor Powder Juice and BC La Campangola.